Last night millions of Walking Dead Fans said a tearful and premature goodbye to Carl Grimes after eight years. RIP Carl. All I can say is God Forgive Gimple. You, Scott Gimple, just changed The Walking Dead forever. Last night it lost it’s central theme of Hope, of Rick fighting to keep Carl safe, of every ounce of humanity that made the series so appealing to geeks like me in the very beginning. Since 10:00 pm October 31, 2010 I have been a passionate fan of this show – I have never missed a live airing of a new episode – but this morning I am sad and I am broken. Waiting for last night was like waiting for a dentist’s appointment; I just wanted to get it over with. Part of me prayed for a Magic Dumpster to save Carl (think Glenn in Season 6) but part of me knew what was coming… and on Sunday, February 25th 2018, it fell with a bang. If you are one of those people mentally telling me right now to hush hush because Chandler Riggs quit TWD to go to college or do other things and thus Carl had to go, you may have been living in a cave for the last three months. According to interviews with Riggs, Scott Gimple told Carl errr Chandler that he was wanted for three more years and after buying a house in Georgia, Riggs was unceremoniously fired from the long running zombie show on AMC and advised of his character’s death. Was it because Riggs was about to turn 18 and could negotiate for more money? Some rumors speculate that Chandler’s father was a problem on set. Gimple’s repeated explanations that Carl’s death was necessary to “move the story forward” fall flat with a giant helping of insincerity. Carl Grimes is alive and well in the comic version of The Walking Dead and Robert Kirkman’s graphic novel seems to indicate that Carl is to grow up to be the leader of the future in the post apocalyptic world. I don’t read the comics but it was clear from the moment that Rick Grimes awkwardly biked his way to his house in Atlanta and stumbled inside frantically calling “Carl! Lori!” to Rick telling Morgan that his family was alive and he was going to find them, that Rick’s purpose was to locate them and protect Carl. Carl was important, the only important thing for Rick, and that simple emotion between a father and a son, a parent and a child, was pure. It’s a huge part of what gave the series it’s humanity and set The Walking Dead apart from all other zombie generated worlds. To really engage an audience and create a television series that soars above the rest requires not only characters that the viewers form attachments to but also a complete trust between the producers, actors and directors and the audience. A symbiotic relationship if you will. Scott Gimple broke that trust with Dumpster Glenn, the season six finale, Morgan being shuffled off to Fear The Walking Dead in an effort to save that show and now this, the unnecessary death of Carl. The final straw. Let me be clear – if Chandler Riggs HAD wanted out and that was the reason for Carl Grimes being bit by a walker and taking his own life (I know how the safety works) I would work really hard to let this go. Perhaps the blame for my own loss of enthusiasm for next week’s TWD episode is reading the internet. Perhaps I know too much. Maybe, knowing that an actor with a part that is so integral to the series I love so much was simply fired and written out… that could be why I am feeling so ambivalent today. I did not re-read my blog post from December, written right after Carl revealed his bite in the Season 8 Mid-season Finale, so it is quite possible that I’ve repeated myself tonight. The last three months have been the same every day – wishing that Carl’s death couldn’t possibly be true. He will be saved! Because if it was real, then it might be the death of my eight year love affair with The Walking Dead. It was real alright. I hates it. 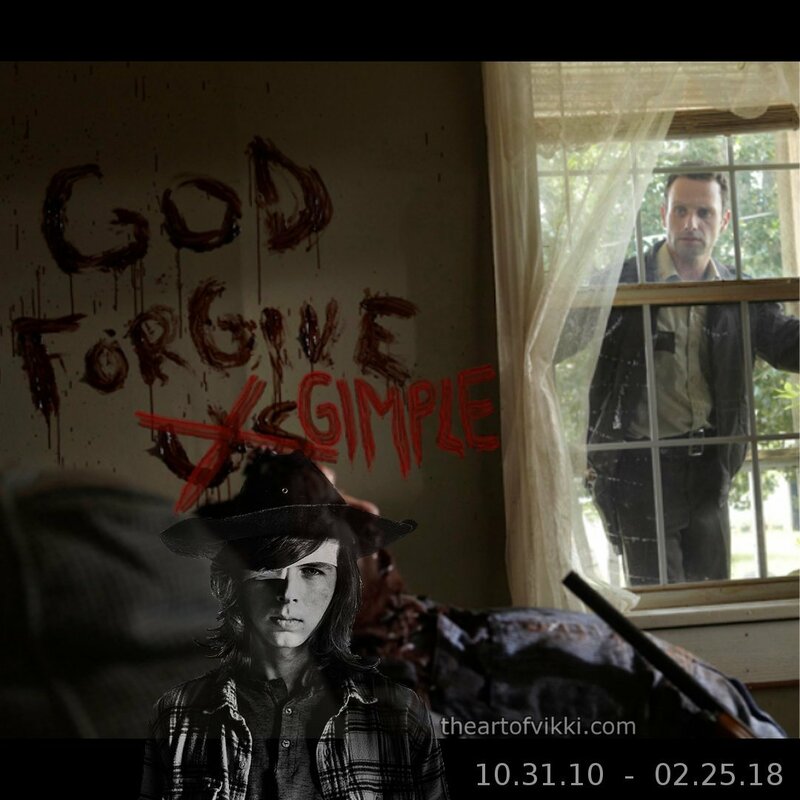 This entry was posted in Geek and tagged amc, amc the walking dead, carl grimes, carl's death, does carl die, god forgive gimple, rick grimes, rip carl grimes, robert kirkman, scott gimple, season 8, the walking dead, twd by The Art Of Vikki. Bookmark the permalink.